Do you have mesmerizing electric blue fire, streaming down the mountain during the night, a turquoise, tranquil, but highly toxic lake with a sunrise that leaves you in awe with various shades of pink and purple as a backdrop, yourself being enrobed in sulphur clouds, breathing into a gas mask,making you look like a soldier on a mission and passing men carrying for hours up to 90 kilos of suplhur in baskets on their shoulders in mind when planning a hike in Indonesia? Glowing blue fire. It is not lava you see, it is actually the light from the combustion of sulphuric gases and when they come in contact with the air, they ignite, sending the flames up. Some of the gases like you see on this picture condense into liquid sulphur, that why it gives the feeling of lava flowing. And would you then expect to come back from this trip, thinking that you would have missed out on a life time opportunity experiencing such a unique aspect of Indonesia’s culture and nature? You don’t? Well, I did not either, but that is exactly what I and a group of my friends encountered and felt during this experience, I will personally never forget. 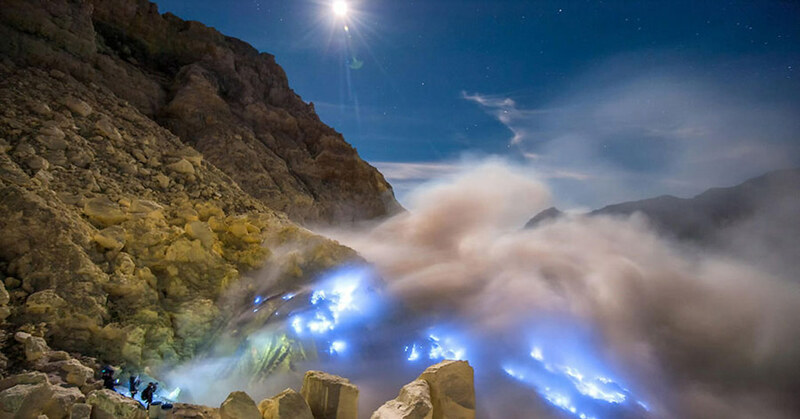 1. Who would enjoy the Ijen Crater (Kawah Ijen) experience? 2. Who I would not recommend this trip to? 3. 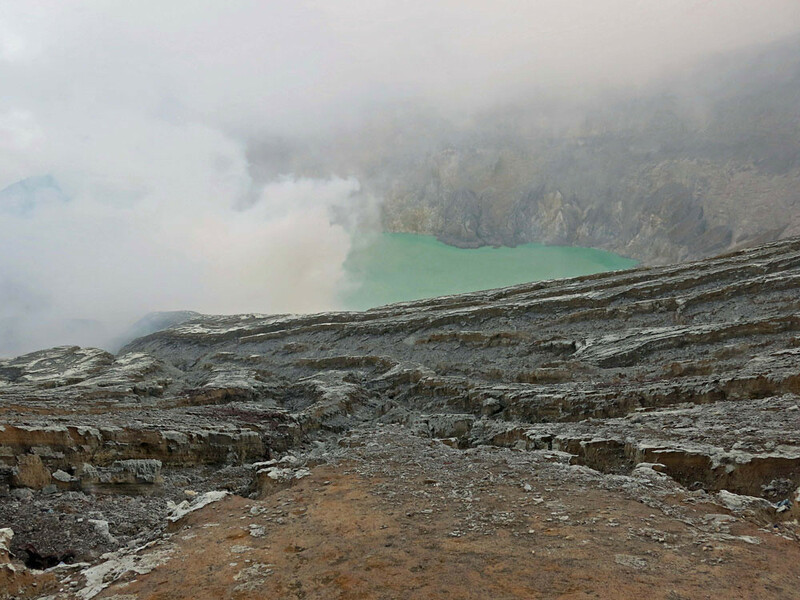 How it’s like to hike Ijen Crater (Kawah Ijen), East Java? 7. How long does the whole trekking experience take? 10. How to find a good guide? Travellers who love nature, natural phenomena but are not afraid of nature’s unpredictability. You can also see a real life sulphur mining operation that makes you humble and being grateful for your life. Travellers who have a passion for adventure and exploring unique and unusual experiences. Also including the harshness, dangers and inconveniences. If you have any existing breathing conditions (asthma, panic easily when breathing anything other than oxygen, etc.) and/or have extremely sensitive eyes, then I would strongly recommend you don’t try to get into the Caldera. You do NOT need to have a climbing experience, or an extraordinary level of fitness, but if you already get out of breath going up a fly of staircase, then you will be a little frustrated, but just a little. You like an easy leisure walk with stunning views only. You do not like unexpected surprises that could affect your hiking experience (change of temperature, changes of smell, various types of hiking trails). You like a guarantee that you will go down the crater on the day of your trip. 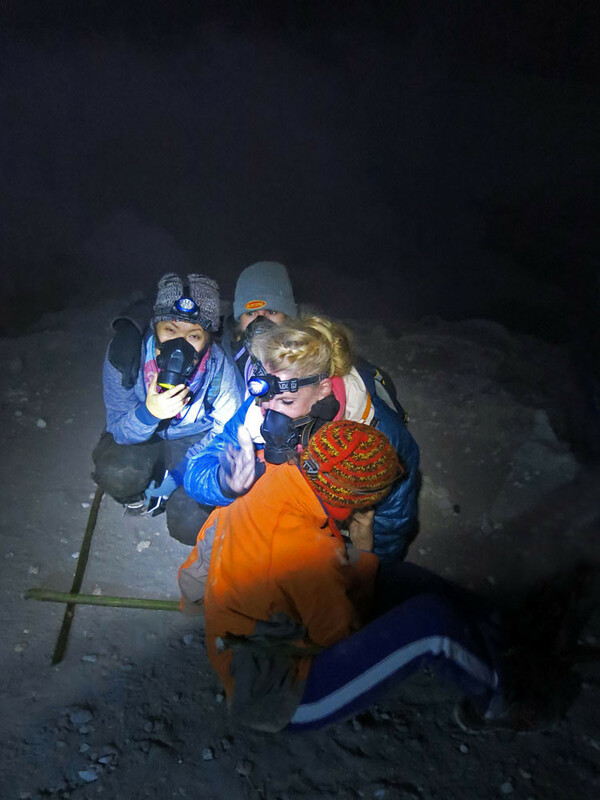 There is no guarantee, nature is unpredictable and if due to massive sulphur clouds it is too dangerous on that day to go down, you have to respect it for your own safety. Unpredictable nature. 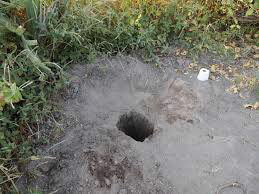 If the conditions are too dangerous to go into the crater, accept it, rather than fighting a war you cannot win. 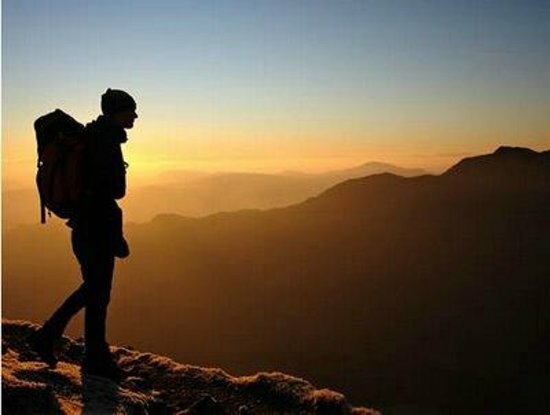 If you feel very uncomfortable scrambling in the dark down a steep rough track, which is not clearly marked, or secured in the dark, or if you do not like to see deep slopes without fences. If you want the security of a rescue service in the area. I have not seen any and I really wonder what would actually happen if somebody twisted an ankle and could not walk anymore. This trek down would be banned as a health and safety risk in any Western country in my opinion. So if you put safety as a priority for your leisure activities, think twice before you do this trek. 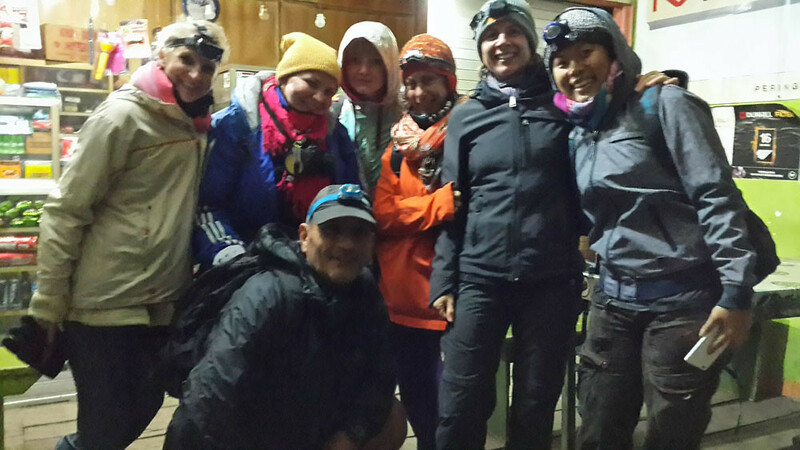 We started off from the base camp for the 4 km trek up the caldera rim at 2 am in the morning. The trek began with a rather easy straight and wide route with no rocks, which snakes up steep slopes for about an hour, so nothing to really worry about. You will get out of breath (I am talking about people with a “normal” fitness level), but since this is not a time race, just take a short break after every 5-7 minutes and regain your breath and you will be fine. We all made it without any problems. The last 30 minutes walk of the roughly 1 ½ hours total walk was easy and mostly flat. I found it extremely helpful to have a pole (our guide made some for us from bamboo he found on the way), to keep balance, but climbing up with it on the first 1 hour really made it easier as well. Oh, one practical advice, too often forgotten, there is no public toilet anywhere once you have left the base camp, so use the toilet there before you start the trek (unless you don’t mind the “nature bush toilet” along the way). We reached shortly before 4 am the crater rim and then walked down into the caldera. It is a bit of a tough scramble, although there is a rough path and on parts some woody handrails, but it is not marked, so be careful where you put your feet, especially in the dark. If you don’t feel comfortable going all the way into the crater, you can also appreciate the flames from a higher distance. It can also be complicated further with significant amount of sulphur smoke. 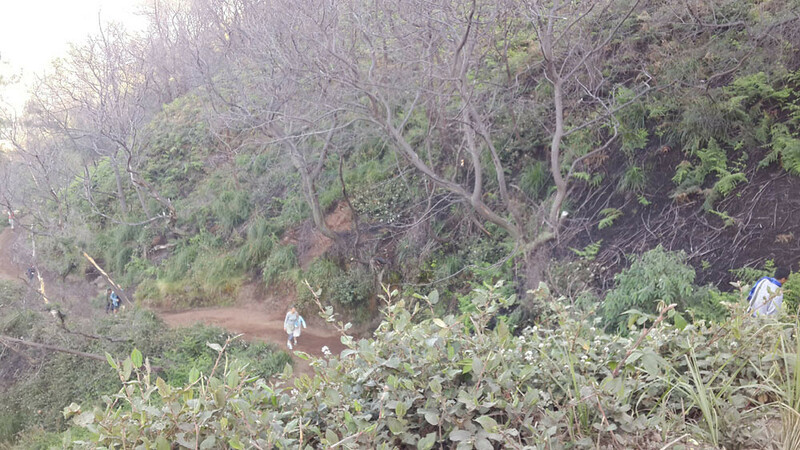 There is only space for one person at a time on the path down the crater, so you follow the person in front of you. Do NOT let anybody pressure you to walk faster (did not happen to us, but I just mention it in case it happens), make sure you are safe and go at your own pace and just let the other person pass. Watch your own security, that is very important. This might sound a little off putting, but if you are fit and can cope with the sulfur and a bit of a rough, but manageable trail down, then go for it, as it is amazing and almost unique in the world. There is a sort of platform further down the crater, from where we watched the magical blue fire in the middle of the night. It is truly a unique experience. This is not a girly cuddle session. That is what you do once the wind blows the sulfuric smoke in your direction. Sit down, close your eyes, breathe slowly into your gas mask and stay calm. No need to panic, nothing is permanent, not even toxic sulfur clouds. Eventually they drift away. Sunrise is beautiful up here, the colors of the lake are highlighted, but the blue flames disappear at 5 am, so you have to come during the night if you want to see them. Not that many people went all the way down to the acid lake (probably because the sulfur clouds are the heaviest there), but we absolutely wanted to experience it and also seeing the mining operation close up. As the name says, the lake is acidic (filled with hydrochloric and sulfuric acid) and hot, so do not go inside or touch it (ok we did put a finger inside, because we wanted to see for ourselves if it “dissolves”). It did not, but seriously, don’t do it and just watch it. After we stayed for about 30 minutes, we took the 2 hours trip back to the base camp. By that time it was of course much hotter already, so we took off our layers of clothes. A t-shirt or light jumper was ok. The look of “warrior” with a gas mask against the toxic sulfur clouds. By the way, do not imitate putting your hands into the water, it is acidic. But curiosity took over naughty Yani and she could not resist to dip her hands for a second into the lake with a surface temperature of 50-60°С. Remember not to touch your eyes when you have previously put your hands in the water. At around 06.00 am we headed back up the crater rim (since it was daylight it was much easier and going up was also less slippery than going down) and from there the easy path down to the base camp. Going from the bottom of the crater back up to the rim. The ascent during daylight was a lot easier than going down in the dark. 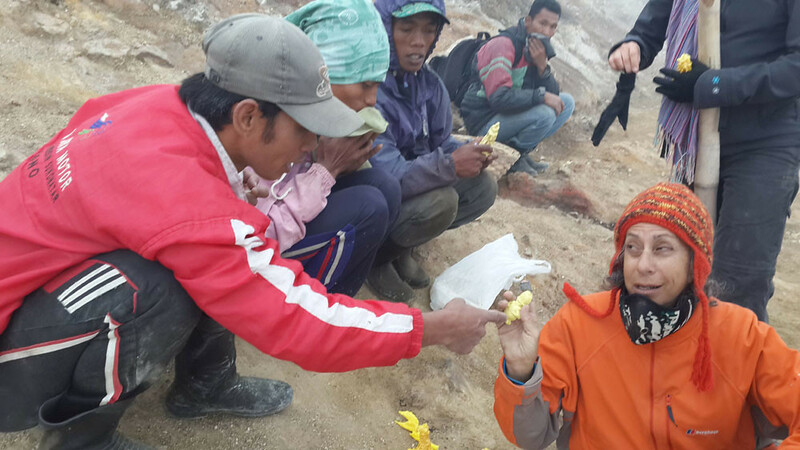 Around the acid lake and on the crater rim you find miners selling figures made of sulfur (the small ones cost IDR 10.000 and the bigger ones IDR 20.000) to make an additional income. Frankly speaking, I have no idea what do with those objects (maybe a paper weight ? ), but we all bought a few, as the hardship of those miners made us want to give a least a small token of appreciation. Miners selling little sulphur figures. Not even our friend Pati knew what to do with her Donald Duck figure, but she nearly bought the whole stock anyway! I think she was their best customer ever. This is the easy part (about 30 minutes of the 1 ½ hours total) up and down from the crater rim to and from the base camp. As you can see, this is really very manageable for even people not considered super fit. 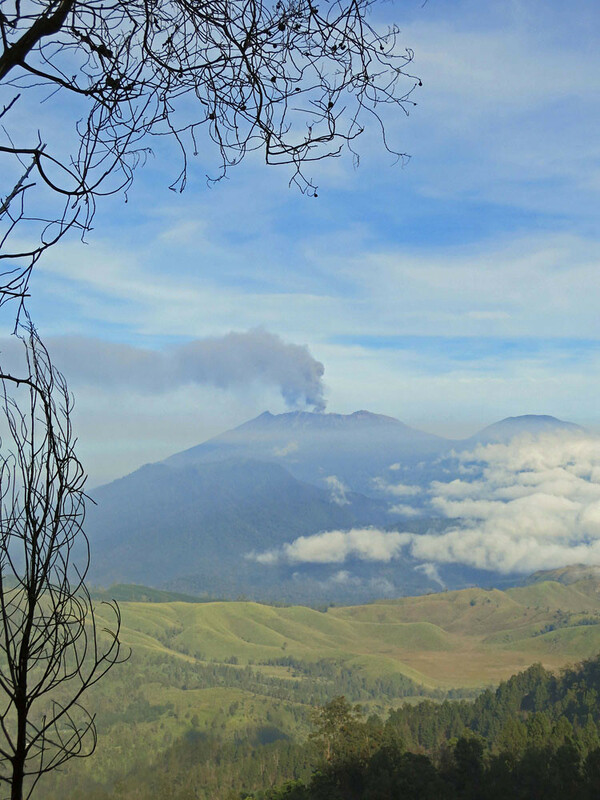 We had this really good view over Mount Ruang, which erupted a few days earlier, while trekking back to the basecamp. Several airports, including Bali were closed for days because of the ashes. The lake is filled with hydrochloric acid which makes the water green. Watching a mining operation close up, even though seeing the hardship of the miners made us feel very uncomfortable, but also grateful for how easy our life is in comparison to that of those men. If you can, try to avoid the holidays and long weekends, because a lot of people will be along the trail leading from the base camp to the crater rim during those periods. 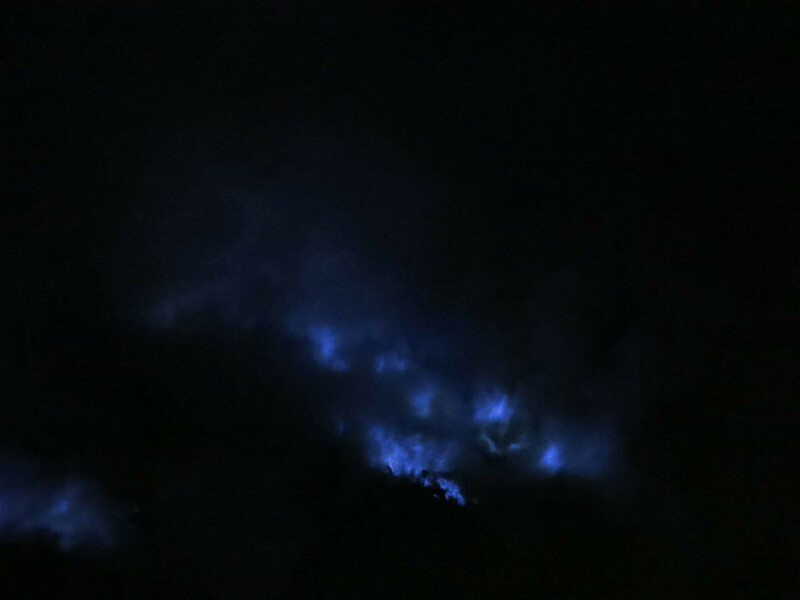 Trek during the night if you want to see the blue fire. It will be gone at 5 am in the morning. There are generally 2 main routes to get to the base camp to start the hike: If you are in Bali, take “The Bali Route”, else if you are in Java, take “The Java Route”. If you are travelling from Bali, you can reach Ijen Crater through Banyuwangi, it’s closer to Ijen Crater (45 km) compared to Bondowoso (64 km). Our group consisted of 6 people, aging between 20+ to 60+ years (a healthy mix of one Indonesian, two Germans, one American, two Russians). Do I need to mention that we were an all girls group. One guy chickened out, because of the ashes from the nearby Ruang Volcano eruption a few days earlier in the area, which also resulted in several airports being closed for days, so much for girls adventure power! Girls adventure power! Not even toxic sulphur gas clouds could stop us! Our group met up at 6 pm in Kerobokan (close to Seminyak) and we drove from there by pre-arranged minivan (it was part of our package) to Gilimanuk, from where we took the ferry to Ketapang in East Java. The approximate normal driving time to Gilimanuk is about 3 hours, but unfortunately there were a lot of road works on that evening, so it took us nearly 5 hours to get to the ferry, but since we left so early, just in case the unexpected happened, there was no time pressure at all. 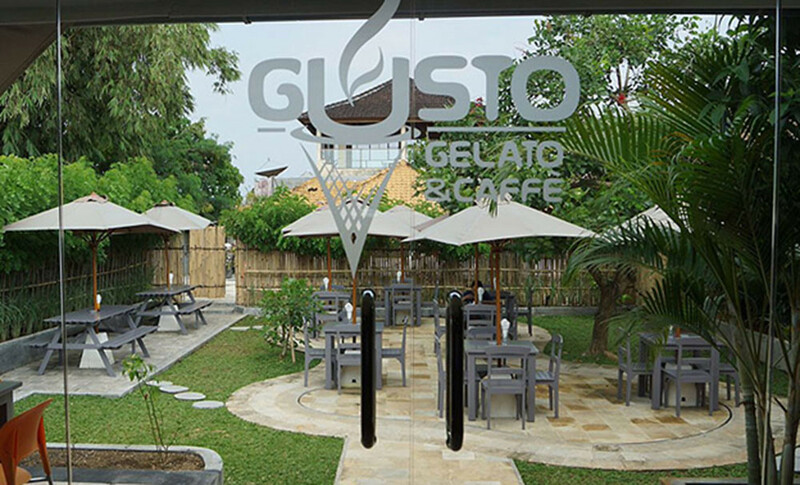 Meeting point Gusto Gelato in Kerobokan. We could not resist a sugar fix before the adventure started. The ferry ride took about an 1.5 hour and ferries leave in about 30 minutes interval (our minivan came with us on the ferry. Do not expect a “Queen Mary” cruise ship experience, it is a basic, but safe ferry), we arrived in East Java and we drove another 2 hours to the base camp climb). 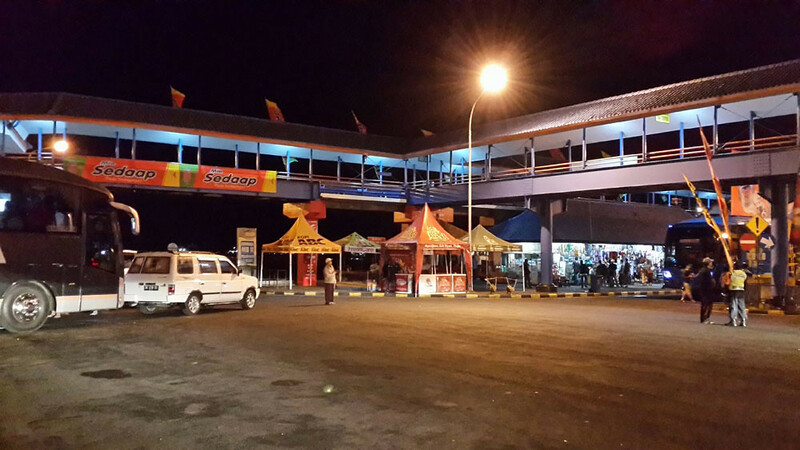 For more information on the ferry and prices you can call +62 333 413730. From the ferry port Ketapang we drove through the Licin route, because it was closer to Ijen instead of driving through Bondowoso on the north side (travel time 2 hours versus 3-4 hours via Bondowoso). We had a good car which you need on this deteriorated road, ideal is a 4 wheel drive. Please note something very important, you will be asked to take a jeep with a driver (I remember it was IDR 500.000 per car) to go to the base camp and that is non-negotiable. The reason behind this, some time ago before the roads leading to the base camp could only be reached by jeeps, therefore many locals invested a lot of money into purchasing jeeps for taking the tourists. Over the years the road has been massively improved, making the jeeps not a necessity anymore. I believe you understand the discontent of the people having purchased those jeeps and now being out of their business. Anyway, long story short, you will have to take the jeep. We took our minivan instead of going by jeep, but still paid the jeep ride cost (was included in our tour package). On the way to the base camp you drive along villages and warungs and they are open until late. Grab a few snacks and drinks here so you are not hungry before the climb. Once in town horse-cart and pedicabs are widely available for you to move around. 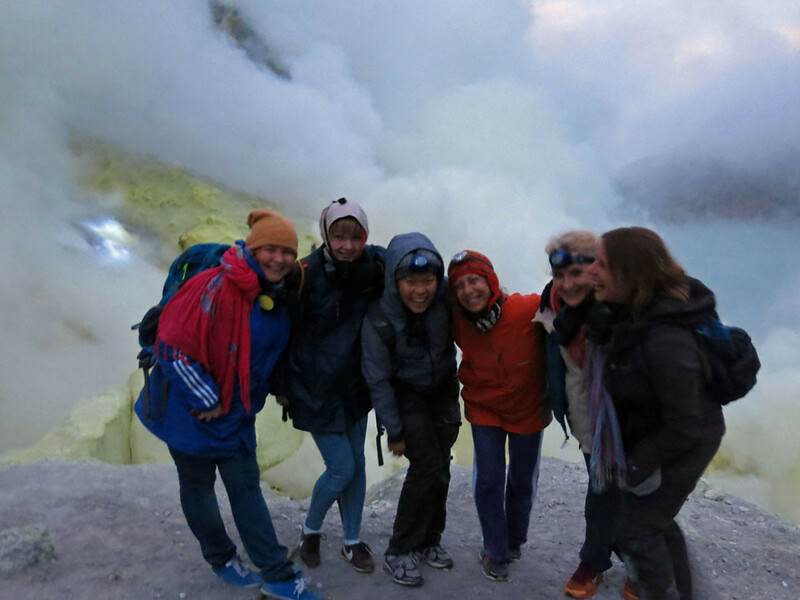 The whole trip from Bali – Ijen Crater – Bali took us 24 hours (we left at 6 pm and returned at 6 pm the next day). 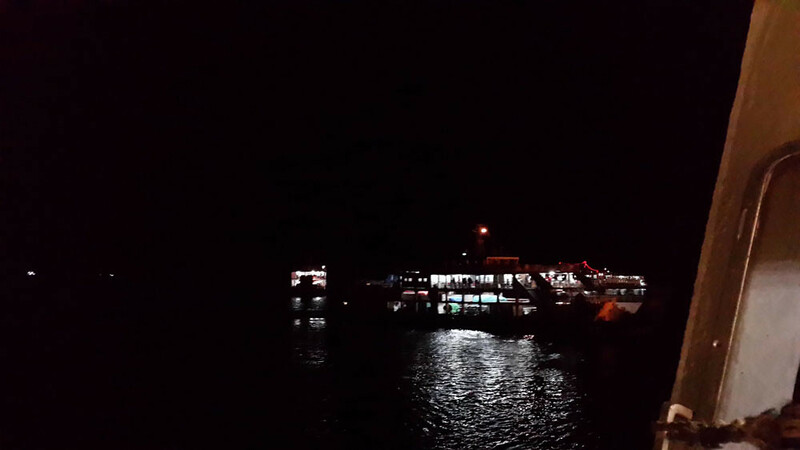 We did not stay overnight and did not sleep during that time, but in case you want to be a bit more relaxed, I think staying for one night in Banyuwangi is a good idea. As we have not taken this route, we have carefully consulted and curated these info for those who are taking the Java Route. It could change without prior notice. 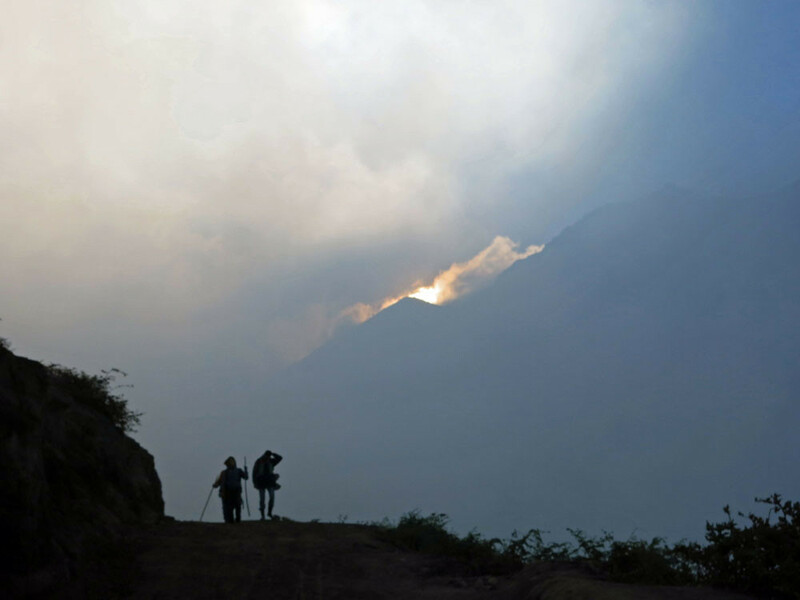 In case you are already in Java the suggested route to reach the Ijen base camp would be through Bondowoso (64 km to Ijen Crater – Paltuding base camp). 6-2-1: If you fly to Java, the closest airport is Surabaya (Juanda International Airport) and from there to Bondowoso it would take about 5~6 hours by car, or 8~10 hours by bus (total 180km, no train transport is possible to Bondowoso.). 6-2-2: Through Bondowoso, you can charter a car up to Pos Paltuding (Paltuding base camp, 64km from Bondowoso) which would cost you anywhere around Rp 400,000 to Rp 600,000 (including driver and petrol). 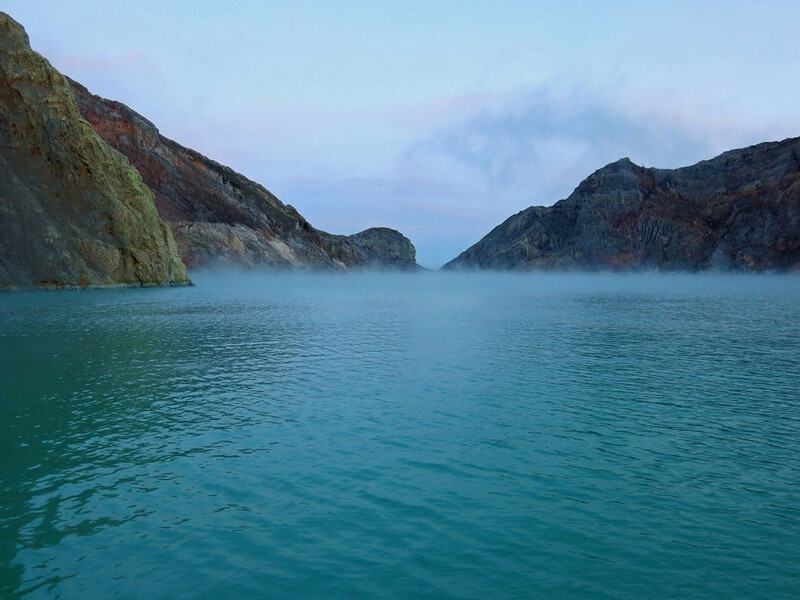 The Ijen Crater’s lake is roughly another 90 minutes hike from Pos Paltuding. * Hire a car is practical way to go in our opinion as the bus journey can be tedious and schedule can be uncertain. The road through here is rather steep and deteriorated to say the least and a 4 wheel drive is necessary. So, how much time should you give yourself for this trip? We left at 6 pm on a Friday from Bali and returned at 6 pm the next day, so no sleep for us, but it was ok, we had naps on the way to Gilimanuk in the car. We were anyway too excited to sleep. On the way back to Bali though, nearly everybody just fell into a coma in the car after having had a really nice breakfast. You can of course go to Java earlier, if you want to explore this part of Indonesia and to avoid the long car ride from Bali to Java in the evening, but our main purpose for this trip was, to do the Ijen Crater trek and nothing else and since all of us were in Bali, that was the itinerary which worked for us, but it is by all means not the only one. Contact Pierrick Bigot, if you need this information, he can tell you all about alternative routes and also 3 days trips which also take you to Bromo. Did we prepare ourselves for this trip? Not really, we just decided spontaneously that we wanted to do it. About one week before the trip we met with our guide, Frenchman and long term Bali resident Pierrick Bigot in Bali to talk about what we would have to expect during this hike and to ensure that we were all aware of what it involved. At that stage we also paid our 50% deposit. I think this pre-trip meeting was a great idea, as everybody had the opportunity to evaluate for him/herself if that trip was for them or not and we could ask the questions important to us. 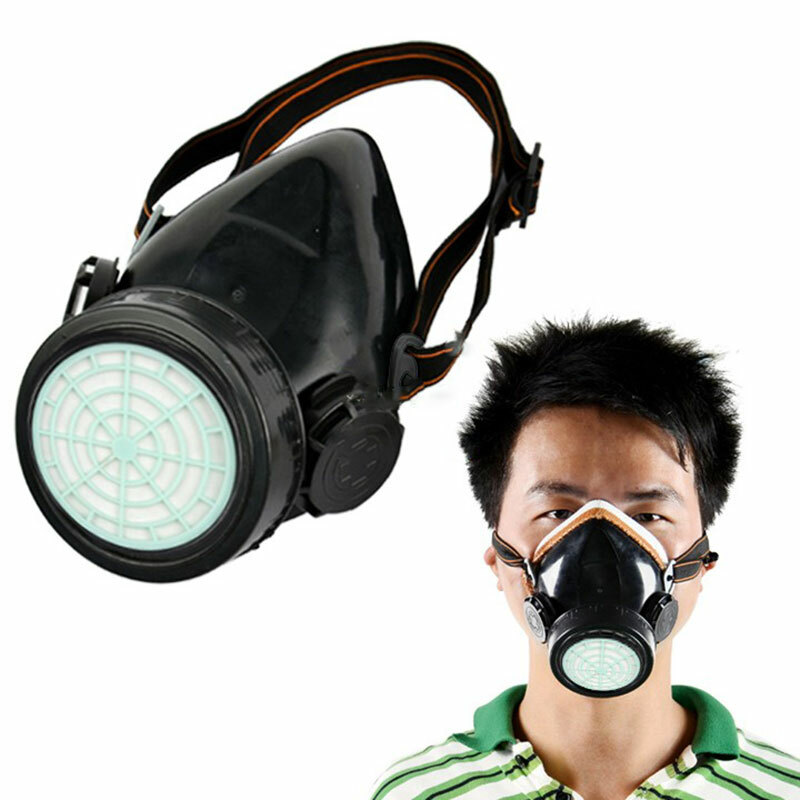 Gas masks, which you need as protection against dense clouds of toxic gases like sulphur dioxide. You cannot stay for a long time in those gases without a mask. It all depends on the wind if you will encounter a lot of those toxic gases on the day of your climb. Some normal protection masks, just in case you don’t like to breath in the sulphur smell and it disturbs you. Some people wore them already on the way leading to the crater rim, while others felt absolutely no need to use them at such an early stage. I was one of them not needing them early on, but it really varies from person to person. Go with what makes you comfortable. No advice fits all. Warm clothes. Now, do not expect the service of a “mobile second-hand winter clothes store” from your guide, but we were very lucky that Pierrick was so kind to come with a “magic” bag full of warm jackets, jumpers, etc. Let’s face it, who comes to Bali or lives there and has polar clothes in their suitcase. So, most of us were very happy to dig into the bag and I ended up with 4 layers of clothes, because it does really get cold in the night. Once we all picked our warm clothes from Pierrick’s “mobile second hand clothes bag” we were ready to go. Ok, ok, we did not exactly exude “très chic” french fashion style, but then Mount Ijen is also not exactly a fashion runway. We were doing this trek during the Ramadan period, so it was relatively quiet, but we were told that during holidays and weekends it can get really busy on that trail. Before this question, more importantly, does one actually need a guide? My personal answer to this one is, no and yes. Of course you can arrange all this by yourself and read reviews, literature, etc. to prepare yourself and if you have all the time in the world, by all means go for it and be completely independent. But after having done this trip, I seriously would not have liked to go through the preparation myself, mainly because it takes too much time and one is also not fully aware of the local culture and Ijen Crater trek etiquette and the potential, but real dangers, so taking a guide saves you time, hassle and ensures your safety and does not need to be a mass tourist experience at all. I think it was money well spend. What the heck? Don’t understand how to get from A-Z and where do I get a gas mask from? Cannot be bothered to arrange this by myself, no way. We found our guide Pierrick on his Facebook page, because he has done this trek countless times, speaks Indonesians, knows the locals around Ijen Crater and how to deal with them. I would also say he was very professional and ensured that we were safe and he briefed us well before the trek (those who had questions could also ask him on facebook) and also again on the day itself. He knew the dangers, how to behave in dangerous situations and how to “read” those group members who might need help. Since he knew we had people of different fitness levels in our group, he recommended to take a second guide and he had good connection and arranged one for us, who was not only extremely friendly and knowledgeable about the trek (he was previously a miner in the area), but also made the people being in the back of the group feel very safe. At IDR 150.000 additional cost (between all 6 of us) this is hardly an expensive price to pay for safety and comfort. Winter clothes (now, this is not a regular inclusion – but maybe if you kindly ask Pierrick he does it for you too -, but our guide dragged along a “mobile second hand winter clothes bag” as a gesture of goodwill for us and seriously those clothes were a life saver, unless you come to Bali with all your winter clothes in place). A very nice local, non touristy Javanese breakfast at a private family’s home (our guide has known the family for many years). It was soooo delicious after this long night. Cannot believe that everybody forgot to take a picture, but I guess we were all too hungry to focus on picture taking. Deposit: We paid 50% deposit about a week before trip, most of us paid the total amount though straight away. Two people dropped out, because they were too worried about the ashes, although Pierrick re-assured them, that this was not a danger and he had done the trek days before. He eventually found two people to replace the two drop outs and therefore the entire deposit to our two friends was reimbursed. 12-1. Wear walking shoes you are comfortable and stable in and which have a good grip. In my opinion, no need though to invest in special trail or hiking shoes, comfort and grip should be sufficient. 12-2. You need warm jumpers and jackets, the best is you have clothes that can be layered and can easily and quickly be put on and taken off. 12-3. Bring a set of clothes to change into once you have finished the trek. 12-4: Take off all your jewelry before you do the trek. The exposure to sulfur will discolor your jewelry. We were told to take it off, but I had forgotten to take one silver ring off and it did not look very silver anymore after the trek and it took a good week for it to go back to its original state, so take every piece of jewelry off. 12-5: You need minimum a protection mask, but if you go further down the crater, you better have a gas mask with you as well to protect you from the sulfur gases. In case you are very sensitive to the smell of sulfur, but are not directly facing the dense sulfur clouds, you should be fine with this kind of mask, notably until you reach the top of the crater. 12-6: If you wear contact lenses, you might want to take them off and wear glasses instead. The sulfur can be very irritating on the eyes. I did wear lenses and kept them in and had no problem, but others might, so just have some glasses with you in case the lenses are irritating you. 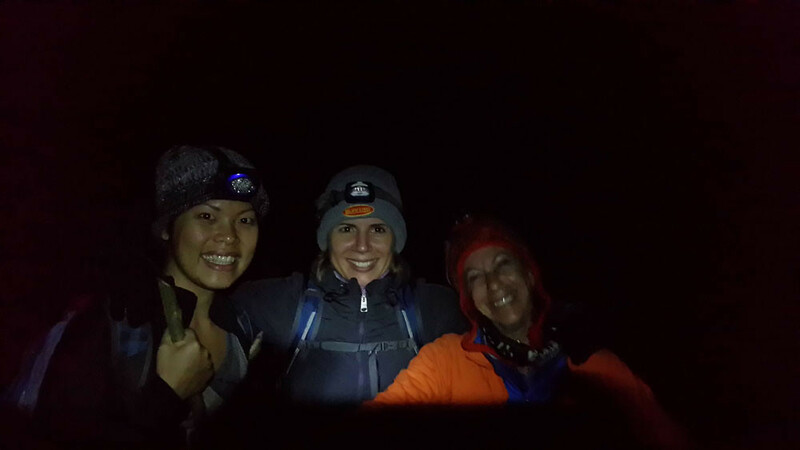 12-7: Use a headlamp or a hand torch and bring some spare batteries. 12-8: It is not such long of a trek that you need a rucksack full of food and drinks. A bottle of water or some other drinks is largely sufficient. You don’t want to be weighted down by unnecessary stuff in your rucksack. 12-9: Ask your guide to carve a pole out of bamboo for you (takes him a few seconds), it really helps to make the climb less strenuous. 12-10: If you are travelling in a group and people have different levels of speed and fitness, I would strongly advise you take two guides. One stays in the front and the second is behind the last person. We did this and it was a very good decision for everybody to feel safe. 12-11: If you know that you feel very uncomfortable breathing in sulfur gases, let your guide know in advance and ask him to stay in your vicinity. A good guide will always help you to feel safe and tell you what to do. 12-12: If you can, avoid the busy holiday periods or weekends as it can get busy on the trail up to the crater rim. 12-13: Have some small money for the purchase of the little sulfur figures the miners are selling (keep IDR 10.000 notes with you). 12-14: There is also a small local warung half way down the path from the basecamp. Nothing fancy, but ok for a quick coffee or tea (no toilets there either, so be prepared). 12-15: Carry only a small rucksack, it is not a huge mountain expedition and you do not need much to carry around. 12-19: I am not a fan of organized tours and even this one you can do on your own if that is what you wish to, BUT for us this trip was so well organized and not mass touristy at all, that it was the best decision made to leave it in the hands of a professional guide. 12-20: When you go down the crater only one person can pass at a time, so if you are behind a person who is not as fast as you are, or feels unsafe going down the rocks, be patient and do not pressure them to go faster. Safety is important. Just calmly overtake the slower people. 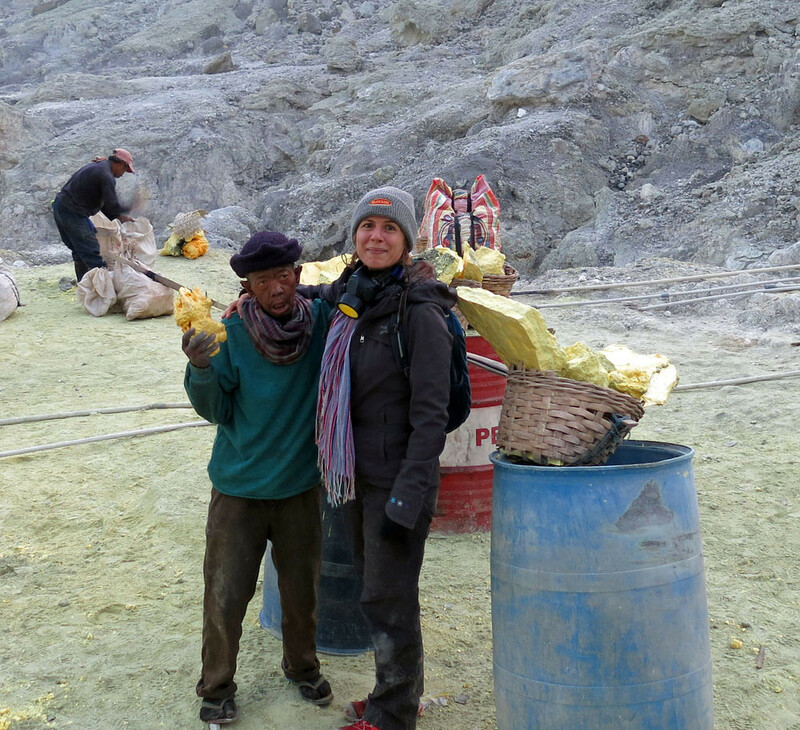 12-21: Ijen Crater Etiquette: You will pass many sulfur collectors with baskets of sulfur on their shoulders and we are talking here about 70-90 kilos of weight on the shoulders of one person! Walking for 2 hours to the base camp. They are doing this trip twice a day! Please, please, if you see a miner coming your way, move aside and let them pass immediately. We are there on a leisure trip and might find this experience an “exotic and once in a life time” experience, but for those men, this is a matter of survival and feeding their families and this is one of the hardest jobs on earth for a salary of about USD 14 per day! 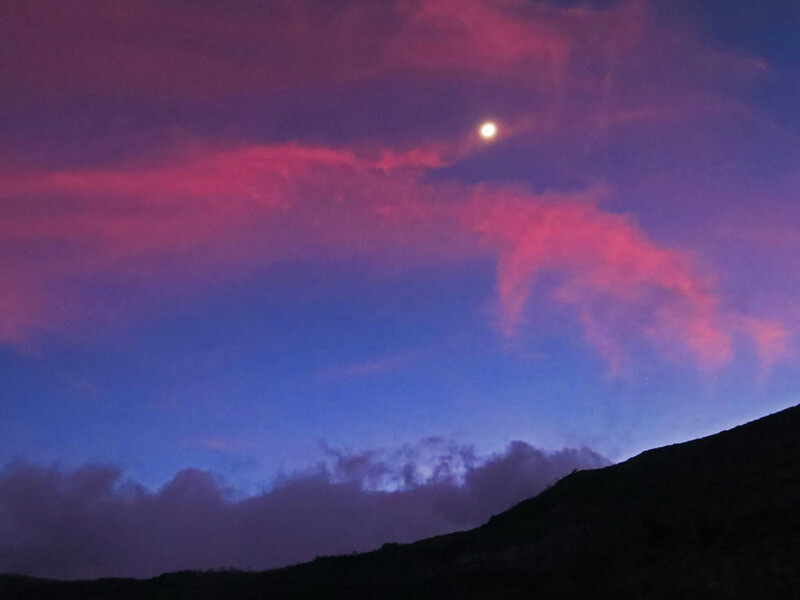 They surely don’t care about any blue fire of hues of pink during sunrise. We do not care, if you have the most amazing photo opportunity right in front of your camera lens, as soon as you see a miner, move immediately aside and let him pass. This particularly applies to the path up and from the base of the crater to the rim. Just imagine carrying a person with a bodyweight of 90 kilos on your shoulders up a steep rocky crater, do I need to say more ? So be thoughtful and polite. They will appreciate you for it. 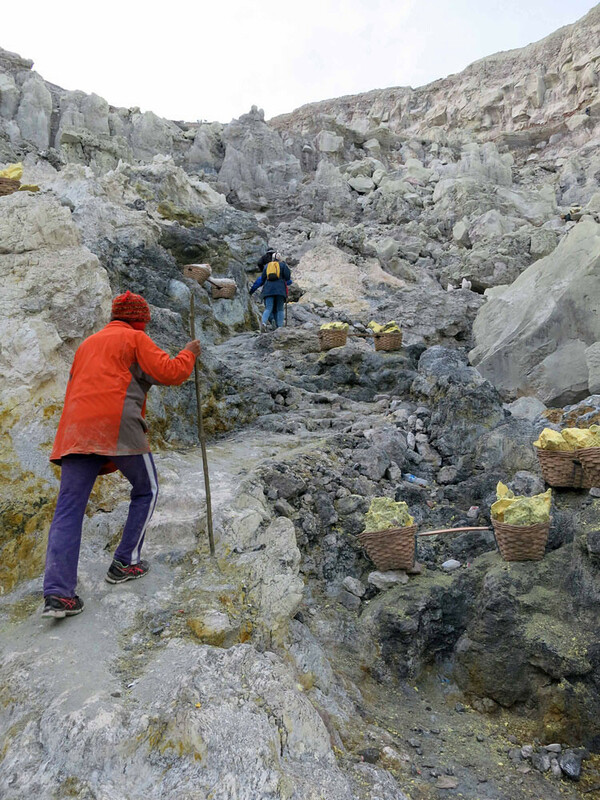 This sulfur collector is balancing with a minimum of 70 kilos of sulfur on his shoulders on the rocks to walk for 1 ½ hours to the basecamp. Every day, twice a day! Considering that their work is so physical and strenuous and them walking for hours, they always appreciate some biscuits for the route, so think about bringing along some packets and just give it to them. It will not change their life of course, but even small gestures, are gestures appreciated. The sulfur figures the miners are selling in all honesty have not much of a purpose from a practical point of view, but selling them helps the miners to provide for their families, so just buy one or a few and even if it is just for the sake of having a souvenir of a one of a kind experience. 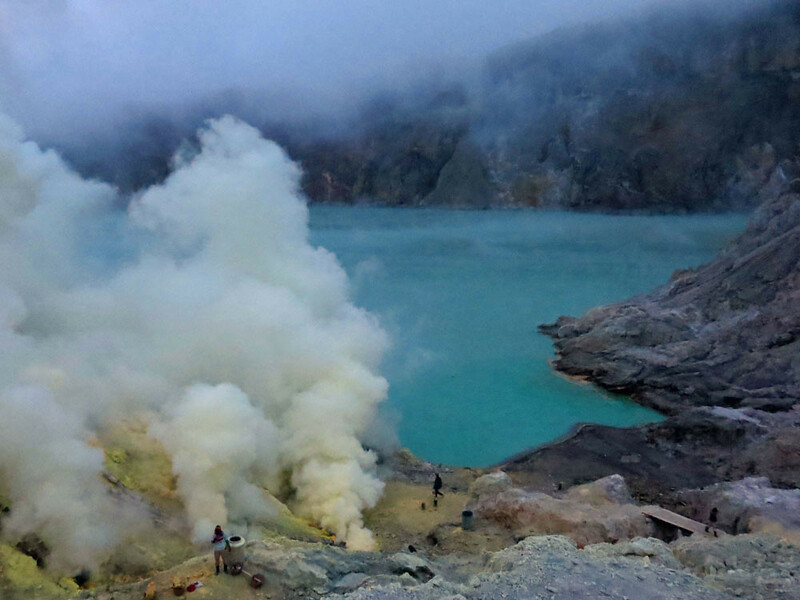 Kawah Ijen is a quiet, but active volcano, and the landscape is dominated by the volcanic cones of Ijen (2,368 asl) and Merapi (2,800 asl) on the northeastern edge of the Plateau, and Raung (3,332 asl) on the southwest corner. The nearly surreal turquoise sulfur lake of Kawah Ijen lies at 2148 m above sea level and is surrounded by the volcano’s sheer crater walls. 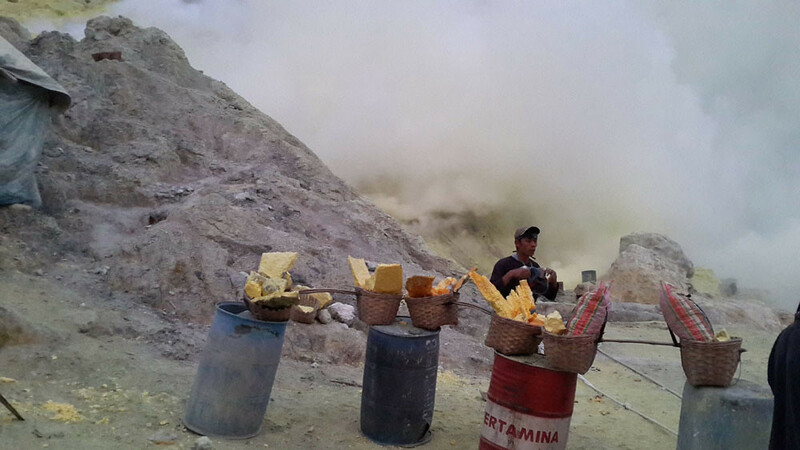 The vent is a source of sulfur and the mineral at Kawah Ijen, because of its purity is worth commercial exploitation. Java’s homegrown sulfur is a natural source of sulfuric acid, in great demand in the oil-refining business and in the production of fertilizers. However, this exploitation comes at the cost of horrendous labor involvement. I am not sure why, but when I stepped down to the lake, the whole natural scenario seemed really surreal and for some reason the first thought that came to my mind was the scene out of the 1968 movie Planet of the Apes when the plane landed in the middle of a really deserted and rocky area. The vent is a source of sulfur and collectors work here, making the trek up to the crater and down (1 ½ hours each way) to the lake every day, twice a day. Sulfur collectors hike up in the morning and return around 1 pm when the clouds roll in. They carry shoulder baskets of pure sulfur (weighing between 70-90 kilos) from a quarry on the lakes edge under the shadow of the sheer walls of the crater. Miners work up to 2 weeks at a time in the crater and many of them die before they reach 45 years due to the constant exposure to the toxic gases including sulfur dioxide. For a daily income of USD 14, which is considered high by local standards, they risk their lives and shorten their natural lifespan to support their families. Some miners only protect themselves with some wet clothes in front of their mouth. Gas masks are sometimes given to them by tourists, but then they don’t have the money to regularly change the filter. To call this mens’ job hard would be an utter understatement. It filled everyone of us with sadness that this kind of work is actually allowed and the only chance for those men to support their families. Miners work up to 2 weeks at a time in those mines, constantly inhaling toxic gases. And this basic hut serves as their home for the time they are working there. Seeing this, puts everything in perspective. Would I have regretted not having done this trip? Yes, Yes, Yes. For me and I think, I can talk for all of us in the group, this was a very unique and amazing experience. Was it a healthy one? Probably not, I can surely think of something healthier than walking down rocky and steeps crater steps and breathing in toxic sulfur air and wearing a mask avoiding to choke like a mad woman, but maybe it was exactly that, what made this experience so unique. There was a lot of unpredictability in this trek. You could have organized it in the smallest details, but on the day you never know what nature holds in store. It was also great to share this experience with friends or newly made friends who were like minded and were just as excited about it as oneself. It was also a great lesson in being grateful for what one has in life, because seeing those miners working in such harsh conditions, makes you very humble. Well, I think this is a little exaggerated, unless you are a miner, working there every day under those harsh conditions, which without any doubt is toxic. However, as a once in a lifetime visitor, I think this description should be taken with a healthy dose of skepticism. Would I recommend this trip, yes absolutely to the people I have mentioned at the beginning of the article. Take every minute of it in and feel blessed for having been given the chance to live and breathe such an eye opening adventure for a day! 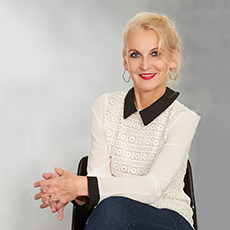 Silke is our luxury hospitality guru with over 20 years of experience in hotels & resorts under her belt, that made her work, live and experience very diverse places , such as London, Kuwait, Paris, Nice, Seychelles, Dubai, Mauritius and Thailand. Silke is responsible for Travelogue and her mission is to create community between travellers, bloggers, Bali industry professionals and helping each other through personal stories, experiences and unique ideas, to travel smarter in Bali.